Are you concerned about the disconnect between healthy eating and engineered, factory-farmed food? 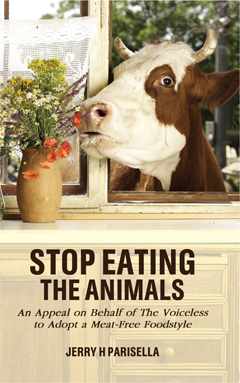 Stop Eating The Animals employs reason, emotions, and beliefs to advance a unique argument from the dual perspectives of human health and animal welfare to show readers how the two issues are inextricably linked. This compelling book looks at what science is revealing about the dangers to human health from consuming animal protein. It examines how we make our food choices and some of our faulty assumptions. And it profoundly reframes the eating of animals’ bodies as not just a simple dietary choice, but as a moral decision with existential consequences. Author Jerry H. Parisella reintroduces us to our beloved pets as “ambassadors” of the animal kingdom. These ambassadors can teach us how very much they and every animal love life and deserve to live it fully, without infliction of suffering by humans. He challenges us with difficult questions like, Why are we thrilled to bring children to an orchard to pick fruit, yet shield them from seeing a slaughterhouse? His salient points are reinforced by numerous fascinating quotes from medical professionals and leading thinkers across time and cultures who advocate against eating animals. Follow Jerry H. Parisella’s transition away from animal flesh. Then use his first thirty days of meals to begin experimenting with your own meat-free foodstyle as the most healthy and humane way to nourish yourself.